The Matilda Building has been rising for the last several months at 1028 N. Hamilton , a project of some well known Spokanites . The building is a four story building with apartments above and commercial space below. We'll likely mention the apartments in separate post once they start to be occupied ( which will also be very soon ) . But, today we're starting to learn what businesses will open on the ground floor, facing Hamilton. A pretty well known chain of Coffee shops based in University Place,WA . The Forza location going into the Matilda Building will be the Spokane areas third location of the chain as they also have stores at 325 S. Sullivan in Spokane Valley and at the South Hill's Lincoln Heights Shopping Center. This location will likely be just like the other Forza Coffee locations and when we asked about when it would open we we're told it was too early in the process to comment. So, we'll keep an eye on it for just when this new coffee shop might open for business. Forza Coffee Co. locations do, of course have a full coffee menu but also a selection of panini sandwiches, breakfast sandwhiches , baked goods and even some small plates and pizzas. Coming to Spokane from their original ( and only other... ) location in Bozeman,MT is a restaurant called Clark's Fork . Since they are also early in the process of opening we don't have very much info on them yet either , like an opening date , but should be getting that soon. The Bozeman location, which will surely have the same menu as the new Spokane Clark's Fork features breakfast & lunch, with much of menu being sandwiches and the breakfast items being served all day. Some baked goods will also be available as are organic burgers , some specialty coffee drinks are available and at least with the Bozeman location a soup & salad bar are also offered. These are the only two sure things for businesses having leased spaces on the ground floor of the Matilda Building. But there is still a few more storefronts that are being actively marketed as we speak by the Byrd Real Estate Group ( 509-326-8080 or http://byrdrealestategroup.com ). They likely won't be empty long as the building is in the busy Hamilton St. corridor only feet off of the campus at Gonzaga University. Also soon people will be living in the same building as these commercial spaces with over 100 bedrooms located in the upper three floors. * Note: while the commercial spaces are being managed by Byrd Real Estate Group the apartment side is managed as a part of NAI Black. What started from a blog about wine & wine culture has grown into a empire of sorts of wine & beer related businesses for Spokane business owner Josh Wade. His Nectar Tasting Room has been a popular Downtown spot ever since it opened in 2011. In 2015 the company branched off Nectar Beer and Wine with a single location in the Kendall Yards Business District and now that brand is about to have a second location. Nectar's owner announced yesterday that the Nectar Beer and Wine concept will open soon in the new building at 907 S. Perry in the heart of the South Perry District. The new South Perry location will be an identical business model as the Kendall Yards location 16 craft beers on tap, 32 quality wines by the glass as well as a retail selection of hundreds of regional beers and wine from around the world . Construction will start on the new location in the first part of 2017 with an opening set for sometime in the Spring. The new location looks very similar and is also designed by HDG Design Group with construction to be done by JNW Builders . The Hastings chain is in it's final days , leaving some more empty retail spaces around the Inland Northwest. But there is one store space that won't be vacant very long and will actually be filled by a very similar yet still expanding chain. The Coeur d' Alene Hastings store at 101 E. Best Ave ( Coeur d' Alene Town Center shopping center) will be immediately converted into a new location for Vintage Stock upon Hastings closure towards the end of October. Vintage Stock is a Missouri based retail chain that just recently celebrated opening their 50th location. The chain is very similar to Hastings and the new Vintage Stock store is hoping to open for business as soon as mid-November. Vintage Stock is hiring and says that Hastings employees that wanted to stay on we're invited to do so. Vintage Stock is buy, sell , trade & rent company that has been in business since 1980. Their merchandise includes movies , music , video games and more . The more even includes comics books, toys , sports cards and apparently some books. The company is buying only a few former Hastings stores and the Coeur d' Alene store will be the only store in the Northwest to be switching to Vintage Stock. There is currently no confirmed news about what store or stores will occupy the soon to be closed Hastings stores in Spokane & Spokane Valley. The business owners behind the new My Fresh Market grocery store are wasting no time in bringing there small urban grocery concept to life. The owners , one which is being Jim Frank who is also the developer of Kendall Yards, broke ground on the site earlier this month and plan to make the project a priority. 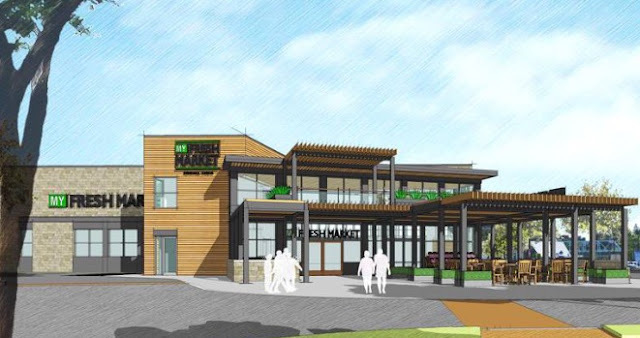 If all goes as planned the new My Fresh Market will open for business in April and will be located by the Eastern entry to the Kendall Yards development at the corner of Summit Pkwy & N. Monroe. Being in a urban setting the store will be small, unlike the massive supercenter type stores typical in suburban areas. Also, unlike those stores My Fresh Market will be a locally owned and operated business with just the single location. - A good sized selection of grab-n-go foods ( pizza, sandwiches , sushi & more ) with a seating area on the front of the building. - Growler station, which will feature both local beers and kombucha . And, some event space. The second floor of the building will be developed as a cooking school with more information on that yet to come. The building is estimated to cost about $8 million to construct with work being done by Vandervert Construction and architectural design by Shoesmith Cox Architects PLLC of Seattle. Recently we announced sale of the remaining Trading Company grocery stores to Yoke's Fresh Market . The growing Spokane Valley based Yoke's grocery chain has now closed on the sale of the stores and has already put up signs and re-named the stores a part of the Yoke's chain, a move that happened quickly. So far Yoke's has basically only converted the signage , staff uniforms , etc... but each store will be remodeled in the coming months. However unlike when Yoke's acquired the former Haggen grocery store in Liberty Lake the stores will remain open during the remodel. Details of the remodel are still coming as they are working on ironing out details of what each local area's needs are. However the stores will be similar to the other Yoke's Fresh Market stores. Each remodel will take about 2 months and the Post Falls Yokes will be the first to be remodeled. All locations should be completed by the Spring of 2017 . The sale included 4 stores that we're operated by Trading Company a smaller locally owned and operated grocery store chain who's owners retired from the grocery business. What's going in out front of Lowe's on N. Division? It's Panera Bread! I've been getting several emails asking about what is going in at the new construction site in front of Lowe's and next to Taco Bell on N. Division . Some thinking this might be the new Popeye's Louisiana Kitchen location we confirmed recently. It is not, Popeye's new store will be just north of there, in the same area as Sportsman's Warehouse ( more on that still to come... ) . Actually this site is being developed for the first location of Panera Bread to fall within the city limits of Spokane. The chain first came to the Inland Northwest in 2015 with the opening of their now successful location at 15716 E. Indiana Ave in Spokane Valley. The chain also just this month wrapped up construction and opened a location in Hayden by the corner of US 95 & Prairie Ave. The new Panera Bread being constructed on N. Division ( 6550 N. Division to be exact ) has no set opening date as of yet, but will likely be similar to the Spokane Valley location. In fact, the building will be the same size with 5100 square feet of space . It also will have both a dine in area and a drive through lane , like all of the Panera Bread chain locations catering services will also be available upon request. The new restaurant will employ around 65-75 total. 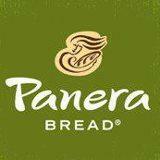 For the time being this is the only not yet open , but announced Panera Bread location to come to the Inland Northwest. There is speculation however that Panera might be a tenant in the now under construction Commons on Regal development on the South Hill but the developer there says he won't release planned tenants names for a while yet so we will just have to wait and see. It's been called one of the most prime spots for re-development in Spokane, the former Wonder Bread factory building has been sold and might not have to sit vacant too much longer. But don't count on construction workers moving into the building anytime soon as the new owner has not yet decided on their plans for the building and / or land. The building, which is just a stone's throw south of the Spokane Arena at 803 N. Post is now owned by a group of real estate investors called Wonder Spokane, LLC . The investment group includes Pete Mounsey , who is the same name behind the recent remodel of the Lincoln View Apartments building at 721 S. Lincoln on the Lower South Hill. Wonder Spokane,LLC says they are beginning to look into what the building could be re-purposed as. The building however will likely be a mixed use development of some kind with 111,000 square feet of space already in the historic brick former factory / warehouse building. The building has not been used since 2000 but has an amazing amount of possibilities for new uses. The site appears on the outside to still be good condition and the parcel is allowed to house a building up 12 stories which could mean they could build up the existing building or ??? . Some parking is already at the site and one building on the lot ( not included in this sale ) has already been renovated and is now going strong as the home David's Pizza. The site holds much potential with the proximity to Spokane Arena, Kendall Yards and even Downtown Spokane which is just across Riverfront Park from the Wonder Bread factory building. As mentioned there is no plans for the building yet so as of now any plans at this point are only heresy but the area is in need of residential space. And, would be a perfect home for a public market which Spokane has been lacking. The possibilities are incredible so the sale of the building could be huge for Spokane. We will continue to watch for news on any future plans so stay tuned! One of only two off site airport parking facilities at Spokane International Airport , Park n' Jet, has announced they are going out of business. The facility is closing largely due to stiff competition of the Airports own parking lots, which includes the promoted North Shuttle Lot which features parking with shuttle to the terminal for only $4 a day. Park n' Jet ( 5602 W. Sunset Hwy. ) offered competitive ( yet higher ) parking rates with extra touches like bottled waters and newspapers included in the cost of parking. But the additional price, distance to the Airport and increased fees charged by Airport to Park n' Jet have taken a hard hit on the company's business. The facility is operated as a division of Diamond Parking Service who also owns the neighboring self storage facility. In the coming months the self storage business will expand onto the land used for parking . That business, which is called Diamond Storage also recently built a group of new storage units on the west side of the site. With the new business direction they also claim to be hoping to include new storage options. Park n' Jet has stopped taking in cars for parking effective immediately but will continue in some operation till the end of September. Employees of Park n' Jet will be laid off, at closing the business employed about 25. This closure effects only the Park n' Jet Airport Parking site and airport parking is still available on multiple on lots owned by Spokane International Airport surrounding the Terminal . About five years ago the Kalispel Tribe of Indians built a new warehouse on property just southwest of their popular Northern Quest Resort & Casino in Airway Heights. A small section of the warehouse was a laundry operation called K-Wash which mostly only did the laundry services for the for the Casino and it's 250 hotel rooms. But seeing an opportunity the Kalispel Tribe has branched out the laundry operation with this Summer's opening a Kalispel Linen Services. This new business is located in a newly constructed 32,000 square foot industrial building immediately south of the warehouse at 202 S. Industry Dr . .The laundry operations inside the warehouse have now ceased ,although other Tribal departments continue to use that building. The new Kalispel Linen Services building will allow for millions of pounds of laundry to be cleaned and dryed each year. In fact, with the additional space Kalispel Linen Services has also secured a contract with Providence Health System to provide laundry services for their area hospitals and health care facilities. The center will also continue doing the laundry service for Northern Quest and likely they will seek out more laundry contracts in the future to keep growing this new business venture. The addition of this new business has also meant more new local jobs. At full staffing the Kalispel Linen Services plant employs 70, which is 50 more jobs then what they had at the small K-Wash operation next door. The new business is actually still hiring for some of these jobs and some have been filled by employees of Providence who came over with the move of their laundry operations to this plant. The abandoned auto repair shop on the southeast side of the intersection of Division & Spokane Falls Blvd. has attracted a couple of prior development plans. Two in fact, and to date the abandoned building still sits there waiting. Perhaps because both plans involved converting the lot into a large high rise, an ambitious plan. But, now a third plan has been purposed and is going to a pre-development conference with the city ( a common first step for projects like this ). And, while nothing will happen overnight this plan seems the most realistic to date. On top of that the developer , University Housing Partners of San Clamente,CA is the same people who recently opened to the new 940 North student apartment building only a few blocks to the north of this site. The plans for the building, which is un-named but would have an address of 230 N. Division, are for it to be mixed use. 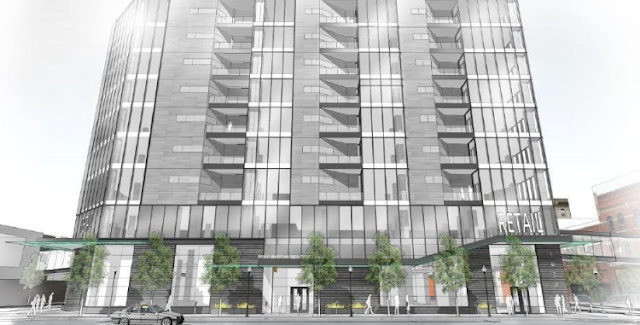 The building would be only six stories ( significantly lower then the previously purposed skyscrapers ) with floors 2 - 6 being apartments , likely similar to the apartments at 940 North which are designed for the students of the close by University's . The location of these apartments would also likely be a selling point also as the blocks immediately surrounding the site have become quite hip in the last few years with several bar's, trendy shops and more all within a easy walk. The new owners , Centennial Properties ( who also own the neighboring River Park Square mall ) are wasting no time flipping the now closed Macy's store building at the corner of Main & Wall in Downtown Spokane. And, while demo work started a few days ago we knew very little of what they had in store for the large former department store. But, that has changed with Centennial's announcement today of the completed project renderings ,etc... . And while plans can change as time goes by ( like how the Davenport Grand first started with a plan to have a brick façade ) this glimpse is exciting, modern and could be big for Downtown. Plans call for a complete re-build to give the structure a more modern look. The mezzanine level in the former Macy's will be completely removed allowing for a first floor with high ceilings. These sections will be renovated first and will be used as retail space with no tenant or tenants yet named. However Centennial does say they are in talks to lease the space and businesses there could even open as soon as the end of next year. The retail section of the project will be separate from River Park Square with a different name and marketing strategy. However the project will surely benefit from the area retail & restaurant businesses which even include a new Urban Outfitters store directly across Wall St from the building that is to open sometime in October . The upper floors renovation should begin after the lower floors renovation wraps up. The 3rd & 4th floors uses are still undecided and will either be office space or apartments. The 6 floors above that will all be converted into apartments giving a new unique place to live in the city center, close to several good sized employers. There will be as many as 90 apartments in the building which will be leased and feature balcony's inset into the building. The apartments, which will be the building's last phase of construction are to be completed sometime in 2018. So, with all these big plans, what will the building end up being called now that Macy's has moved on? Turns out Centennial Properties will be holding a contest to allow the public to name the building with entry's being accepted during the month of October. This contest will be available online on River Park Square's web site and in person at the concierge desk on the first floor of River Park Square. After spending several months in a smaller leased space in Spokane Valley the new Spokane Comcast call center is now in it's permanent home bringing hundreds of new jobs to the local area and giving Comcast / Xfinity customers an improved customer service experience. The new call center takes customer service calls for the company's many technology driven products and answers calls for Amazon.com customers wanting information, etc on the Comcast products offered on the Amazon website. Even though the call center is now open for business, hiring for the new facility is still ongoing as the company hopes to have 750 employees once the center is fully staffed. The new Liberty Lake call center is one of three new customer service call centers Comcast has planned in an effort to boost the companies customer service image which has not been as positive as they would hope in recent years. The other new call centers will open in Tucson,AZ and Albuquerque,NM . The Liberty Lake call center boast two stories and approximately 80,000 square feet of space. It is located within the Meadowwood Technology Campus ( corner of Mission & Molter Rd. ) here it joins a couple of other companies that have large amounts of local employees like Liberty Mutual Insurance & Providence Health System as tenants there . In fact during today's opening celebration event Liberty Lake Mayor Steve Peterson made note when he came into office ( for this term ) in 2012, Meadowwood was not operating yet and had a total of 2 jobs at the site. Today with the opening of the new Comcast Call Center , Meadowwood Technology Campus is now home to over 4000 jobs with even more new buildings on the drawing board. The new Comcast call center is huge for it's amount of new jobs created but it's also noteworthy that the bulk of those jobs went to local citizens from the Spokane area. In fact 85% of the current workforce at the Comcast call center we're hired from this area with the majority of employees travelling from Spokane itself out to work in the center. A new donut shop opening soon in North Spokane is promising to bring great donuts and a bit of nostalgia to it's customers once they open. 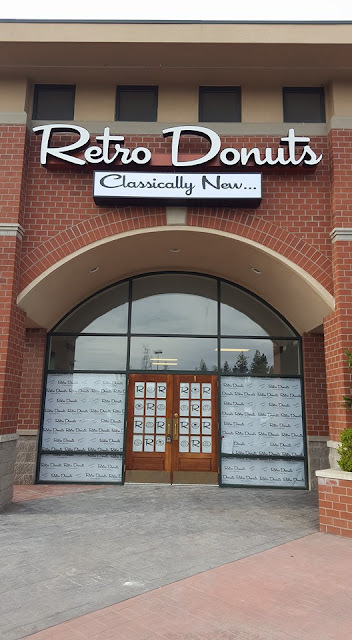 The aptly named Retro Donuts is under construction as of right now but should be open for business sometime in early October and will be located in the Pinewater Plaza building at 10925 N. Newport Hwy. The business owners say they are committed to " creating a unique and beautiful donut café, unlike anything you have ever seen before " . Most of the product will be made from scratch on site and the selection of donuts promises to amaze as they plan to have over 60 different varieties of donuts that are rotating with over 40 types displayed each day. They say the donuts at Retro Donuts will primarily be the classic styles of donuts, no crazy cereal toppings, etc... although some donuts sold will feature candied bacon. The shop will allow customers to pick up their donut or eat in and take advantage of the new business' free wifi . Also being in the end cap space of the shopping center allows them to have a drive up window that will also open when the rest of business opens. In all the business will occupy just over 1700 square feet in a space that was last used for a Mexican restaurant. And, as the name would imply donuts will be the highlight of Retro Donuts, but it's not all they'll have. Of course with any good donut is a good drink so they plan to over pour over coffee, ice cold milk , juices and more. They hope use locally sourced ingredients whenever possible and will have some fundraising programs available . Popeye's Lousiana Kitchen IS coming to Spokane! We have now confirmed the long running rumor that Popeye's Chicken is coming to Spokane! Exact details will be coming soon but commercial real estate broker NAI Black is reporting via Twitter that Popeye's Lousiana Kitchen has purchased a little over an acre next door to new Sportsman's Warehouse store in North Spokane. The site's address is 6720 N. Division and it likely is the land just south of Bruchi's. We'll have these details hopefully in the coming days. It's time to address the major construction site many of my readers have been noticing on the northwest corner of N. 4th & Appleway in Coeur d' Alene. The project is, as it appears, a complete rebuild of the building that last housed Uva Trattoria , a Italian restaurant that has since moved to Downtown Coeur d ' Alene. Perhaps because the building has always been a restaurant people assume it is being remodeled for another one. This is not the case however this time, in fact soon you'll be able to stop by that same building to buy a new cell phone ( perhaps even the new iPhone7 ) or have one repaired as the space is becoming a Verizon Wireless store operated by the Knoxville,TN based Verizon retailer , Cellular Sales. This will be Cellular Sales first location to open in Idaho and is part of the company's rapid expansion into the Western United States. Their closest store currently is in Kennewick but they actually operate 560 stores total in 30 US states, this will likely mean it won't be the last location to open in our area although no other stores are planned at this time. The Coeur d' Alene store will be a full service Verizon Wireless branded store, and while it looks like they have a long way to go today they say they'll be opening in the building ( 2605 N. 4th St. ) by October 10th. The opening will also create a few new jobs as Cellular Sales plans to hire about 20 employees before that opening date. As of right now this is the only active construction site at the corner of N. 4th & Appleway, but there has been a on again, off again rumor of a new strip mall to be located on the land right behind this new cell phone dealer. It would replace another small center that was there but got severely damaged by snow loads during the 08-09 winter season. We'll continue to keep an eye on that aspect as there is still a couple of for sale signs in the immediate area. A chain of more casual spa's called Seva Beauty is expanding our way with a location being worked on as we speak in Airway Heights. The chain, which is called Seva Beauty has leased an in store space at the Airway Heights Wal Mart ( US 2 & Hayford ) and they hope to open for business sometime this month. Most Seva Beauty locations are within Wal Mart stores , except a very select few locations in free standing buildings. Seva Beauty is a Chicago based spa company that describes themselves as fast-casual spa, meaning Seva's services are provided cheeper then the traditional spa's and with their locations typically in Wal Mart stores they are easy to find and more convenient then some alternative's . Seva Beauty provides facials, waxing, eyelash extensions , make-up application , eyebrow tinting, eyebrow shaping & more. Staff members( which they call beauty gurus ) are fully trained and no appointment is needed for their services. The company is also now hiring for their new positions at the new store. For the time being the Airway Heights Seva Beauty will be the only location in Spokane market but that could change and they do have locations in Western Washington and another in development in Southern Idaho ( Nampa ) . The Inland Northwest area chapter of Goodwill Industries is continuing to grow both their thrift store chain and their non profit workforce and family services programs. As you may recall Goodwill recently announced plans to be one of two tenants coming to a re-developed former Albertson's store on Northwest Blvd in Spokane , and now they also moving forward with a brand new center and store on the western side of Post Falls. The new Goodwill facility at Post Falls is under construction now at 4040 E. 16th St , at the corner of Hwy 41 & 16th . The new center will replace a leased space on Seltice Way elsewhere in Post Falls and will have over 24,000 square feet of space. The project is estimated to cost over $ 3 million and should be ready for opening in the Spring of 2017. 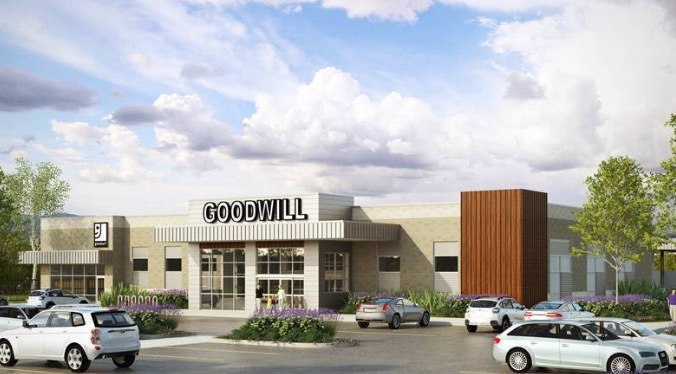 Once complete Goodwill anticipates creating 15 or so new jobs with the new facility and all employees from the current location will be transferred over. The facility will house a Goodwill thrift store, in addition to offices of the workforce & family services division of Goodwill, these programs today do not have office in Post Falls , prompting local users to have to travel to Coeur d' Alene or Spokane. The Goodwill Workforce & Family services office will include job placement services, a career center and support staff. Like all other Goodwill store sites, a place to make donations to the non profit will also occupy a section of the new building. The Quilting Bee , a locally owned and operated sewing & quilt sewing retailer is expanding and relocating to a new building of their own. The store will build a new stand alone building which is already under construction at 16002 E. Broadway , just down the street from Kohl's in Spokane Valley. The store's new building is news in part because it will mean a lot more space for the store but also it will have a very unique look as the new 11000 square foot building will resemble a country barn. The Quilting Bee has been in business for over 30 years and this will be the third time the business has moved onto a new larger location. The new store location should be ready to open for business in the Spring of 2017 and will remain in business at their current location on Mission by Applebee's in Spokane Valley until then. The new store will feature more retail space for all of their sewing and quilting supplies , in addition to sales of whole sewing machines with The Quilting Bee being an authorized dealer of Bernina brand sewing machines. In fact, the store even allows customers to " test drive " all of the models in the Bernina line. The new store will also have a larger sewing machine service & repair area , a kids play area and a man cave to keep spouses busy and entertained while waiting. Just like now The Quilting Bee will also continue on with their classes offered on site, in fact some more will likely be added with a portion of the new store space dedicated to classes and special group events.